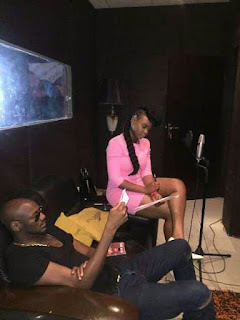 Yemi Alade and 2face a.k.a 2baba are teaming up unleash a new music. Yemi Alade might have just released her acclaimed sophomore LP “Mama Africa”; nonetheless the diva was pictured recording new material with 2face in the studio in the shot above. Key details about the song are unknown but it is rumoured that it is a song for 2face’s upcoming album. We are sure it will be a banger and we cannot wait.